Welcome to our new website. 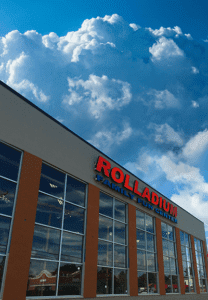 Like our Rolladium Family Fun Center, we’ve renovated, remodeled and expanded the site too. We’re happy to finally share pictures and info about the new experiences awaiting our customers. For adventures on wheels, our roller skating rink has been remodeled, from floor to ceiling. In fact, there is no ceiling. The roof has been raised back to its original dome. You’ll feel like you’re skating under the sky with new lighting for glow-in-the-dark fun like never before. And don’t worry: We carefully preserved our classic, hand-laid maple skating floor. And, a new video games arcade. The latest new sensations. Plus all your favorites. In one big bright room with the ropes course rockin’ high above you. There’s even a photo booth so you can remember every visit. You’ve driven by our renovation for months. Now it’s time to stop in and have some fun. Be sure to register for coupons and special offers. Hi… I am excited to see your historic rink is continuing to grow new skaters and new entertainment options for families!!! Can’t wait to come visit. wossup!! Just love the posts here. respect to you guys for the great assistance. My cousin is only four yrs old, and he managed to broke his leg. Is this usual? Should he stop or keep going after he heals up ?